No added color and a high-contrast dial from a single material – with a special touch for the full moon! 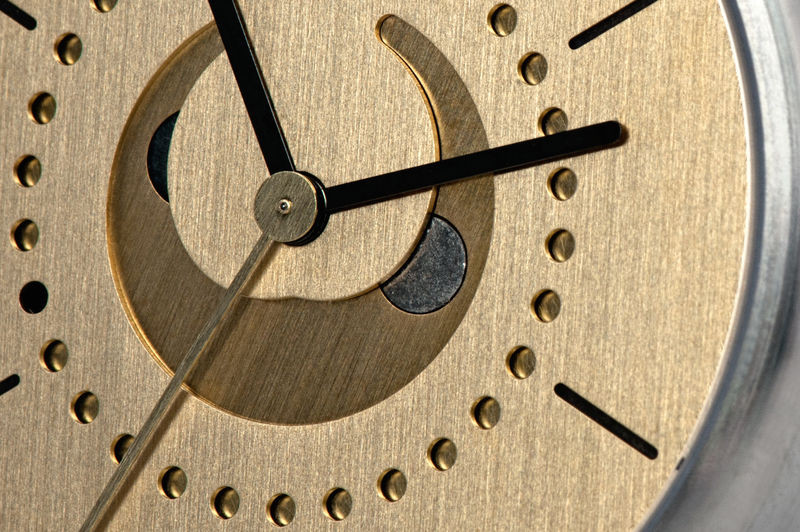 The dial, date disk, moon disk, and hands of moon phase brass are all executed in brass. The sun at 12 o’clock is milled-out, while the hour and minute hands, milled markers, new moon (10 o’clock) and date dot (21st) are hand-patinated to provide high-contrast with the dial. The second hand is in brass like the dial, so that the time is immediately visible when you glance at your watch, and the second hand is ready whenever you need it. 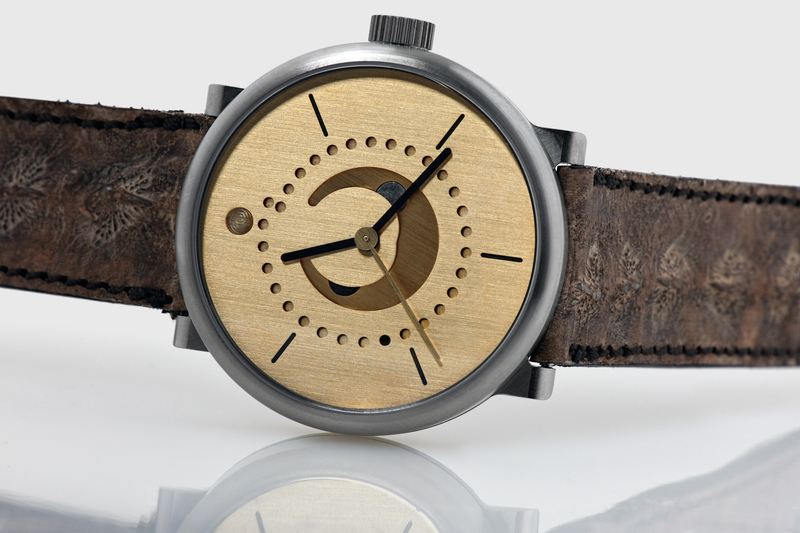 You can also order your personal moon phase brass with an excentric second dot like on annual calendar brass. 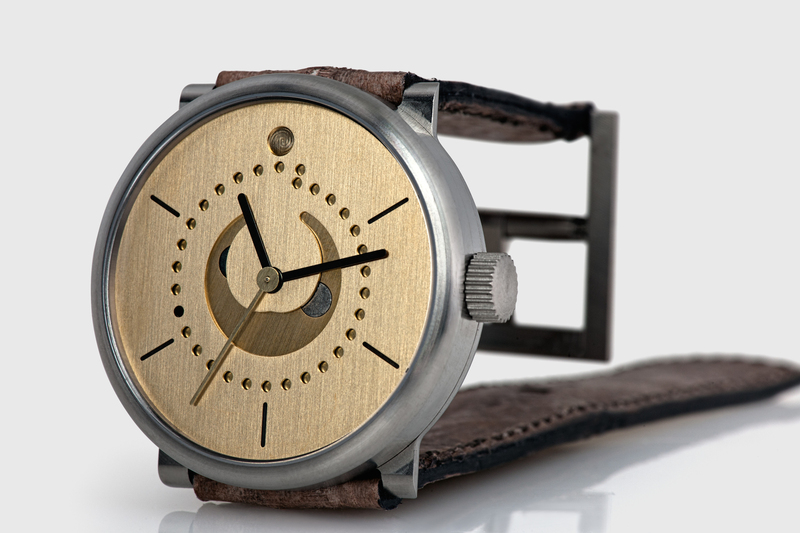 And – the special touch – moon phase brass features a hammered, solid platinum PT950 full moon. The watch in the pictures is fitted with ochs und junior’s water-resistant sturgeon leather strap. 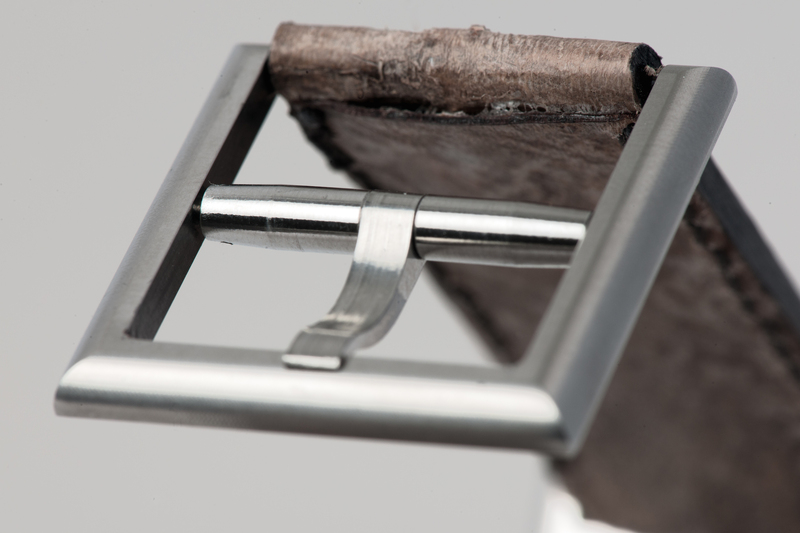 These straps are handmade to order in Switzerland. The sturgeon skins come from a cutting edge renewable energy greenhouse project in Frutigen, Switzerland. More information about the strap in the full blog post. You can alternatively fit your personal moon phase brass with a black rubber strap or eco-tanned calf leather in 38 colors. The watch in the pictures is 42mm titanium. 39mm and 36mm sizes are also available, as well as a silver case. ochs und junior watches are exclusively sold directly from our workspace in Lucerne, Switzerland. Your ochs und junior can be shipped worldwide via FedEx, or you can visit us in person. For questions or to purchase, please contact cofounder Beat Weinmann.